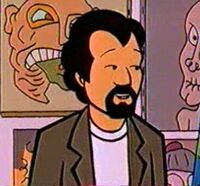 Gary is the owner of Gary's Gallery, making his only appearance in the episode Art Burn. Gary is a congenial man and a big fan of art, believing people want recreations of famous paintings because, unlike the pictures of paintings in a book, an actual painting has (sic) greater "vibrancy" and a "palpable energy". In the episode, Gary hires Jane Lane to make replica paintings for him, offering to take a 60% commission (which is not a good deal for the artist). When Jane has saved enough money for her intended expenses and wants to quit, Gary convinces her to stay by lowering his commission (to 40%) and giving her a choice of which artists to do. According to him, she was his best artist. His insistence makes Jane briefly convince herself that he was running an art counterfeiting ring, so she could quit the job without remorse. Even though that was not the case, she quits at the end of the episode. This page was last edited on 25 April 2018, at 16:51.